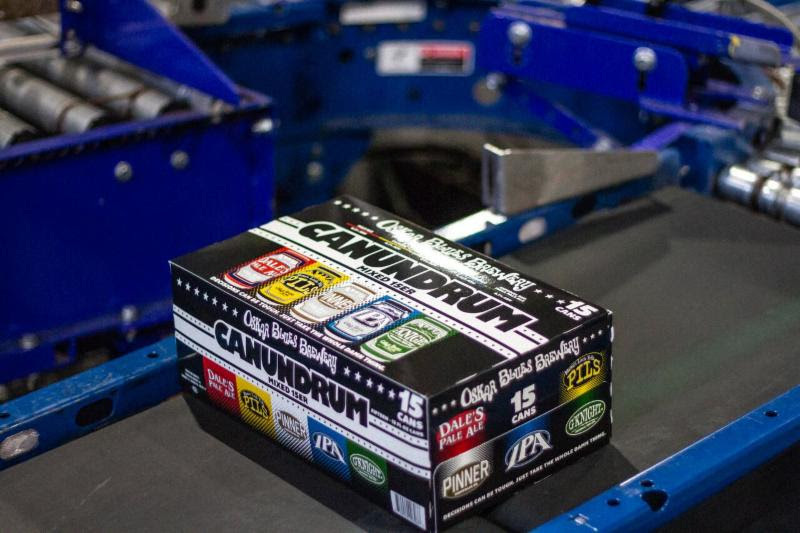 (LONGMONT, CO) – The Oskar Blues Brewery CANundrum variety pack, previously presented as a 12-pack, is now available as a 15-er dream team of the brewery’s best core offerings. Oskar Blues provides more diversity to the beer drinker with the new format, which will be distributed nationwide starting Sept. 1. Oskar Blues is one of only five craft breweries in the U.S. to release a mixed 15-pack. Oskar Blues Brewery has crammed five straight-shooting brews into one box. So what’s inside? Dale’s Pale Ale, the voluminously hopped mutha and #2 selling craft six-pack in U.S. Grocery, plays centre. This pack’s power forward is Mama’s Little Yella Pils, a true-to-the-style, uncompromising pilsner brewed with pilsner malt and Saaz and Aramis hops. Pinner Throwback IPA rocks the small forward position with citrusy, tropical fruit notes and a biscuity finish at an incredibly crushable 4.9% ABV. Playing shooting guard is OB IPA, a metamodern IPA crafted from hand-selected Australian hops. Rounding out the lineup is G’Knight Imperial Red Ale at point guard. The U.S. Open Beer Championship recently honored G’Knight Imperial Red IPA with a gold medal in the Imperial Red IPA category. Up 121% in 2018, this monstrously malted, sadistically smooth and well-balanced beer is America’s Velvet M-80. G’Knight is an OG Oskar Blues beer brewed and named in honor of a real life American hero, Gordon Knight. Knight was a Colorado craft beer legend, decorated Vietnam vet and Purple Heart recipient who lost his life in a helicopter crash while fighting a wildfire outside of Oskar Blues’ birthplace of Lyons, CO. The 15-pack offers more of what today’s craft drinker demands – variety. That desire is demonstrated by 32.6% growth YTD in mixed can packs. Additionally, many of the “Impact Brands” identified by the BA in 2017 were mixed pack offerings, demonstrated by the success of the Oskar Blues shrink-wrapped CANundrum 24 multi-pack with packaging engineered by The Dow Chemical Company, which is up over 400% YTD. Oskar Blues’ CANundrum is the choicest choice you don’t have to make. Why pick one Oskar Blues beer when you can have ‘em all? Play to win and find a 15-pack CANundrum near you using the beerfinder. Founded over 20 years ago in Lyons, Colorado, Oskar Blues Brewery launched the craft beer-in-a-can apocalypse with their hand-canned flagship brew, Dale’s Pale Ale. Today, Oskar Blues operates breweries in Colorado, North Carolina and Texas while reaching 200,000 barrels per year and featuring Dale’s Pale Ale as the nation’s top-selling craft can six-pack at U.S. supermarkets. The makers of the Original Craft Beer in a Can continue to innovate with creations like The CROWLER, Hotbox Roasters, B. Stiff & Sons Old Fashioned Sodas, The Oak Room, Oskar Blues Fooderies, REEB Cycles and the cycling-inspired accommodations and event space at REEB Ranch in North Carolina. Oskar Blues is available in all 50 U.S. states, Washington, D.C., parts of Canada, Puerto Rico, Sweden, Norway, Finland, Spain, France, the Netherlands, Belgium, Luxembourg, The U.K., Ireland, Australia, New Zealand, Chile, Brazil, and South Korea. Along with Cigar City Brewing, Perrin Brewing, Squatters Craft Beers and Wasatch Brewery, Deep Ellum Brewing and Three Weavers Brewing, Oskar Blues Brewery belongs to a disruptive collective of like-minded craft brewers known as CANarchy, the largest canned craft beer supplier in the country. To keep up with all things Oskar Blues, visit http://www.oskarblues.com/.